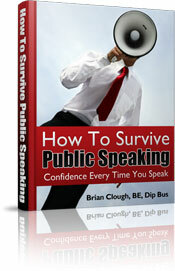 Thank you for ordering your "How To Survive Public Speaking" ebook. To get your copy of the ebook just click on the image below and then Save the pdf file to your computer. A reminder: Your credit card or bank statement will show a charge by ClickBank or CLKBANK*COM, rather than a reference to this specific product.